If I were to characterize the general theme of the Favorite Edition 2013 list thus far, it would be “chill”. The albums I’ve been drawn to the most are very quiet, not the usual blast of sturm und drang I usually indulge. But just because they’re quiet doesn’t mean they aren’t unsettling. Perhaps more telling is the number of new releases I’ve listened to so far this year: 15. Not a big pool from which to draw a list of 10 favorites, which is why there are only seven. Compare that with the total number releases I’ve bought, including catalog: 61. Yes, I get deeper into catalog the more I age. I knew it would happen eventually, despite my best efforts to resist. One thing I try to bristle against is fashion, even if on some level I agree with said fashion. And right now, vinyl is fashionable. It’s a fast-growing format, according to the New York Times. Though only 1.4 percent of the total market, vinyl record sales has seen an 18 percent growth since 2011. Manufacturers, however, say they press far more than sales indicate. But my resistance to this resurgence is rooted in memory. 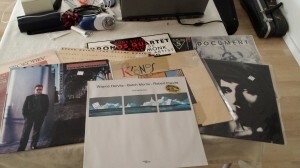 I bought records when I was the age of the young people snatching them up now. From 1985 to 1989, I built a collection of nearly 90 some odd records. Then the demands of convenience encroached on my purchasing habits. A cassette tape Walkman was easier to bring on a bus ride than a turntable, and eventually, a portable CD player offered a better listening experience than a Walkman. Back then, compact discs were priced higher than records and cassette tapes because they were considered the “premium” format. The industry transitioned away from those analog formats and trained consumers to accept premium prices as baseline.